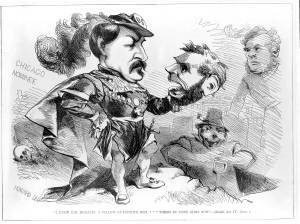 "I Knew Him, Horatio …"
McClellan, in the character of Hamlet, stands near an open grave holding the skull of Abraham Lincoln. He soliloquies, "I knew him, Horatio: A fellow of infinite jest … Where be your gibes now?" The cartoon evidently appeared following publication in the New York World of a scandalous but fabricated account of callous levity displayed by Lincoln while touring the battlefield at Antietam.